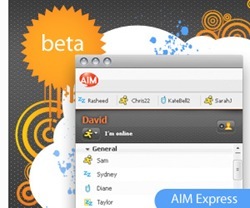 AIM Express 7.0 Beta : Send IMs to your friends without installing any software. AIM Express service is convenient whenever you're away from your home computer: at school, the office, or a friend's house. Talk to your friends from any computer with a Web browser and access to the Internet. Requires Flash Player to run AIM Express.